It is thought more than 120,000 people came to Cleethorpes for the National Armed Forces Day celebrations. The Prime Minister and Duke of Kent were among those who visited on Saturday. David Cameron was in no mood for talking as made one of his first public appearances since announcing that he would step down as prime minister following the UK vote to leave the EU. The PM honoured a commitment to attend the Armed Forces Day event in Cleethorpes, North East Lincolnshire, but gave no public speech. Mr Cameron chatted to dignitaries on the platform and applauded at the section of the parade devoted to veterans in wheelchairs. As he got into his car to leave the town, he managed a brief wave to the crowds. A man has shouted 'traitor traitor' at The Prime Minister David Cameron as he arrived in Cleethorpes for National Armed Forces Day. Mr Cameron announced yesterday that he intends to step down from the role following the result of the EU Referendum. 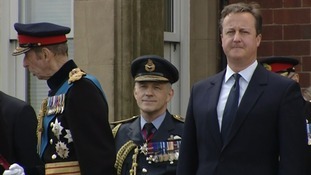 Mr Cameron alongside the Duke of Kent were applauded as they were introduced to the crowds, before they watched the Armed Forces Day parade. 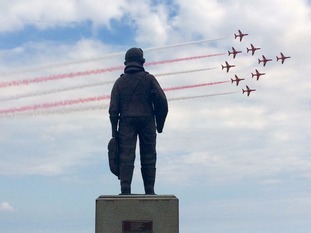 It is expected over a 100,000 people will be in Cleethorpes for National Armed Forces Day. Brexit will 'not weaken' defence, Michael Fallon The Defence Secretary has told ITV Calendar. Mr Fallon is in Cleethorpes for the National Armed Forces day. He said: "We will work harder with our allies and on our commitment to NATO." Asked who he would like to see as the next Prime Minister he replied: "It's too early to speculate until we see who the candidates are." He said that David Cameron had 'done the honourable thing' by resigning adding: 'You need a new Prime Minister to take forward the exit negotiation." North East Lincolnshire Council have released park and ride details and information on the free amenities available over this weekend. 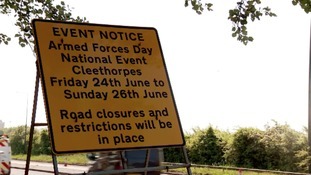 Sections of the main road through to North East Lincolnshire are being closed in readiness for a National Armed Forces Day parade. Doncaster Central MP Rosie Winterton watched this morning's armed forces parade through the town centre. She says it is a great opportunity to celebrate the contribution made by those who gave their lives serving their country.